Urban Protests in Brazil: Unions Follow in the Wake of Popular Demonstrations. Home Editorials Urban Protests in Brazil: Unions Follow in the Wake of Popular Demonstrations. Since 2001 it has become common to speak of a group of “rising powers”, rapidly developing countries which will overtake the established powers of Europe and the USA. This BRICS group, composed of Brazil, Russia, India, China and South Africa, have been heralded as the new drivers of the global political economy. 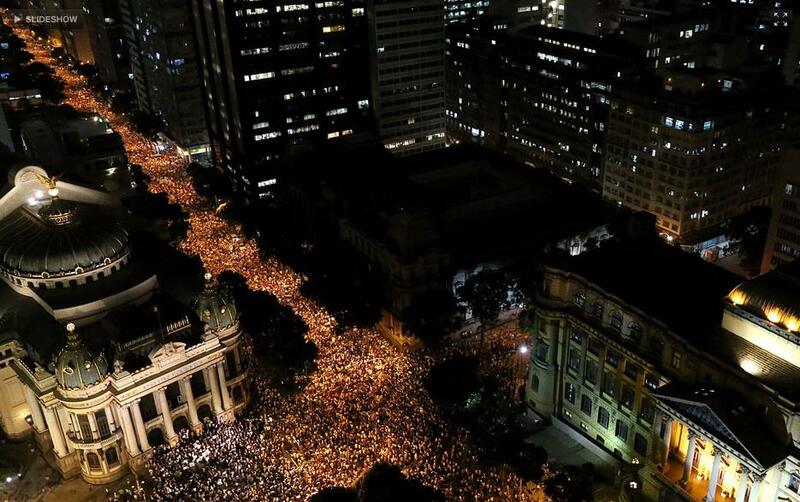 Recent protests in Brazil have cast doubts on such a narrative. In this guest post, Phil Robertsanalyses the underlying dynamics as well as key agents in these mass demonstrations in cities throughout the country. Alongside this new economic primacy, the BRICS group has become the setting for the mega-events which dominate the symbolic national rivalries played out through sports. India recently held the Commonwealth Games, whilst in 2010 South Africa hosted the first World Cup ever to take place on that continent. China’s hosting of the 2008 Olympic games was fÃªted as a resounding success, and likewise Russia will host its own World Cup in 2018. The 2013 Confederations Cup was intended to be the first in a series of triumphal mega-events to be held in Brazil. Using the facilities being developed for the 2014 World Cup, itself a stepping stone to Brazil’s hosting of the 2016 Olympics, this event would demonstrate that Brazil had the structural and economic capacity to host the most celebrated international sporting occasions. This would herald Brazil’s arrival at the top table of developed nations, possessing wealth enough to satisfy its population and produce wonders besides. The reality of the last few weeks has been rather different. From the outset, the Confederations Cup games have taken place in a context of social unrest and mass protest, as Brazilians took to the streets and lambasted their government. The initial protests in Rio de Janeiro and SÃ£o Paulo took place under the banner of revolt against increased public transport fees. However, subsequent mobilizations have been quick to assert that the problem “NÃ£o Ã© sÃ³ 20 centavos” (is not just 20 cents.) Middle-class, and especially young, Brazilians gathered together to condemn government corruption, high taxes and poor public services and to demand “FIFA standard” investment in health and education. In order to understand this sudden eruption of popular protest, it is necessary to examine the underlying economic, political and geographical processes involved in Brazil’s rise to “great power” status. To say that these protests are specifically urban in nature is not just to speak of their location. The protests reflect how the urban environment is shaped by processes of capitalist development. As David Harvey points out in his recent book Rebel Cities: From the Right to the City to the Urban Revolution (2012), recreating the built environment through successive waves of urbanization has always been central to the absorption and accumulation of capital. This is visible right now in cities of the rising powers, as slums in India, South Africa and Brazil suddenly become valuable properties via financial speculation. Poor and middle class populations are driven out of urban centres, either by state intervention or private violence, and communities are broken up and relocated in the urban peripheries. Brazil’s hosting of the World Cup and Olympic Games has only exacerbated this process, as flows of national and international capital enter urban communities in search of high returns on investment yielded from the spectacle of these mega-events. Brazil’s growing importance on the international level has distorted local geographies. Mega-events have further accentuated the inequalities and contradictions embedded in the capitalist economies of rising powers. This increased peripheralization of poor and middle class communities has given rise to other detrimental effects, distancing them from public services such as health and education, and burdening them with higher transport costs. Although it quickly recovered from the global financial crisis of 2008, Brazil has recently experienced slowing growth and faces rising inflation, particularly in the prices of basic foodstuffs. The population is thus faced with a rising cost of living coupled with diminishing prospects for economic growth and investment. If this general condition was the powder that would ignite in popular protest, the 20 centavos rise in the cost of transport was the fuse, and the Confederations Cup provided the spark. 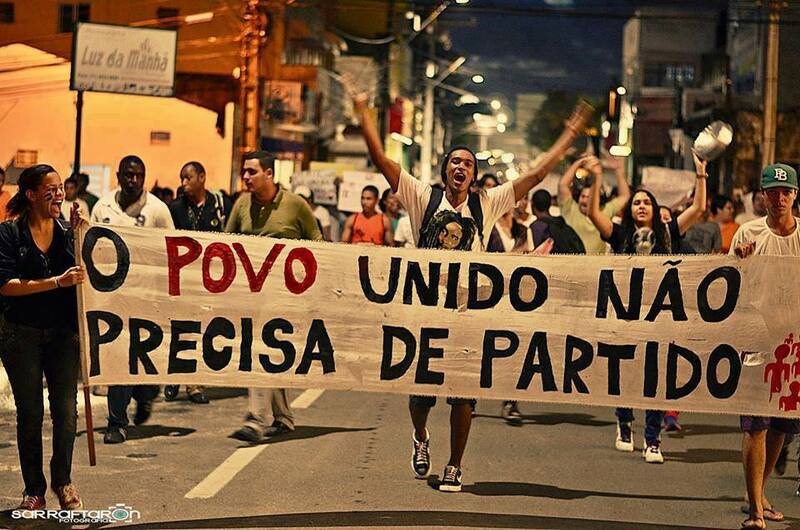 People united need no party! The character of the protests has to some extent resisted analysis, offering no clear and coherent vision of their purpose and duration. Part of the reason for this is that the demands set out have been both piecemeal and apparently heterogeneous – from the specific demand of a reversal of a price hike, to general demands over corruption and investment. Some protesters have even called for the impeachment of President Dilma Rousseff. This last demand is indicative of the heterogeneous makeup of the movement: whilst there is common cause for complaint against specific issues, the political opponents of the ruling Workers Party (PT) are seeking to direct the force of public discontent against Rousseff’s bid for re-election in 2014. The popular mobilizations have not taken place under the banner of a single leading group, but contain a plethora of groups each of which have failed to extend their hegemony over the rest. Strikingly, activists carrying the banners of various left-wing parties have been forcibly ejected by the protesters, as those directly involved in the struggle have resisted subordination to the leadership of those involved in formal politics. The Passe Livre (Free Pass) organization has stood as the figurehead, though not the actual directive force, of the protests. Their manifesto very acutely summarizes the experience of those disadvantaged by Brazil’s urban development, linking public transport to accessing other goods such as healthcare and education. If transport is unaffordable, these goods are lost as well (http://saopaulo.mpl.org.br/tarifa-zero/). Passe Livre is an overwhelmingly student-led and middle-class group, and its basic proposals centre on free public transport for those in education, although this has been broadened more recently to encompass free transport for all. The social benefits of their campaign are therefore strongly skewed towards the aspirant middle class rather than the worst off who possess little time or opportunity to study. Organized labour is yet to take a prominent role in the protests. Whilst youth activists from the Central Ãšnico dos Trabalhadores (CUT, Central Labour Union) have undoubtedly been present, the unions have not exercised any leadership or directive force over the mobilizations. Although the CUT, together with other unions and movements, sent an open letter to Dilma Rousseff during the most tumultuous period of protest, it is only now as mobilizations are diminishing that strikes are being discussed. A coalition of unions and social movements including the CUT, ForÃ§a Sindical, and CONLUTAS is now calling for strikes on the 11th of July, centred on much the same demands as raised by the popular protests. However, far from guiding and organizing the popular mobilizations, these actors have followed in their wake and seem now locked in a struggle to demonstrate their relevance and power. Still more disturbing, these groups have not succeeded in mobilizing the very poorest in Brazilian society. Those living in the favelas have been only a minor presence in the urban protests, and have only recently begun to mobilize in significant numbers. Given that these are the groups most affected by rising transport prices and poor public services, unions and other movements appear to be failing in their role of enlarging struggles to include those most vulnerable. Cleaning the city for the games! The victories won by those who took to the streets have been considerable and rapid. Within a week of the first demonstration, the mayors of Rio de Janeiro and SÃ£o Paulo agreed to reverse the price hike in public transport. Shortly thereafter, President Dilma met with representatives of the Passe Livre movement before issuing a message of support and a 5 part plan which will focus on more state investment into education and healthcare. 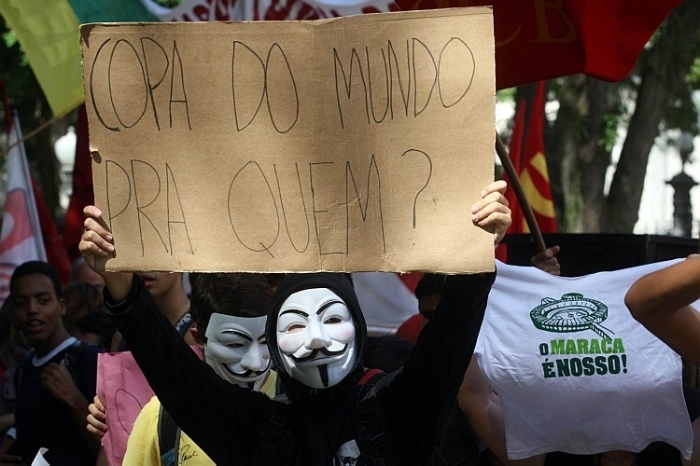 On the 25th of June, the Brazilian Congress struck down the proposed PEC-37 legislation which had been vilified by the movement: its provisions would have afforded greater protection to politicians involved in corruption and increased police powers. PEC-37 was widely expected to become law before the popular demonstrations began, but the Brazilian legislature effectively backed down in the face of popular dissent, voting 430 to 9 against its passing. It is tempting to conclude that we are witnessing the birth of a new phase of Brazilian politics. Here an educated and militant middle-class wins popular victories without submitting to the schemas of more traditional, and therefore more compromised, political organizations. However, it should be borne in mind that although the protests have forced concessions which lessen the impact of capitalism’s urban process upon the middle classes, they have done nothing to undermine that process over the long term. No group has succeeded in convincing the masses that peripheralization, poor access to services and rising transportation costs are merely the immediate and visible aspects of the underlying dynamics of capitalist development. Without collective organizations capable of extending popular protests into struggles for political transformation, the labouring classes of Brazil will continue to cede the initiative to the capitalist class. Harvey, David (2012) Rebel Cities: From the Right to the City to the Urban Revolution. London: Verso. Phil Roberts is a 3rd year PhD student in Politics and International Relations at the University of Nottingham. His research focuses on the potential of the Brazilian Landless Workers Movement to form a counter-hegemonic project, and engages with Marxist theorists including Antonio Gramsci and Henri Lefebvre. He is a fellow of the Centre for the Study of Social and Global Justice, and is supervised by Dr. Adam Morton and Professor Andreas Bieler. For a follow-up to this analysis see Salad Revolution but no Passive Revolution: The Continuation of Hegemony in Brazil by Phil Roberts!